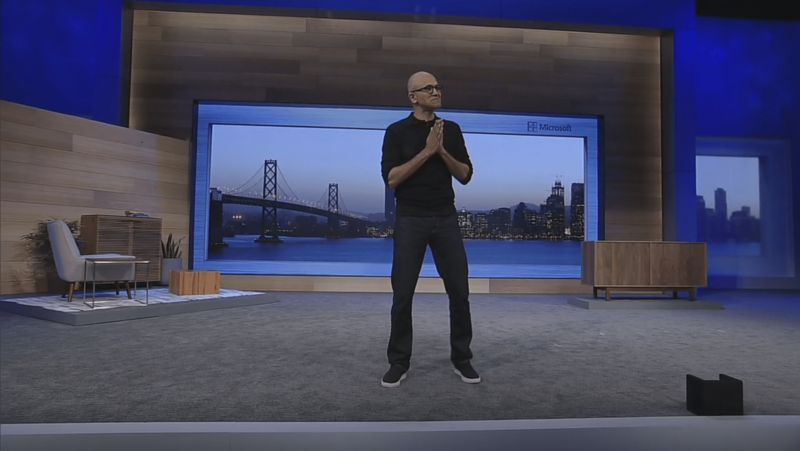 The first day of Build 2015 blew my mind! I’m going to take you on the journey as I saw things. I went to twitter feverishly as I saw all of the technical goodness that Microsoft was sending our way. First up, we get to hear from relatively new CEO, Satya Nadella. Next up on stage was Mark Russinovich, who is super smart and really understood how the operating system worked more so than almost anyone who worked at Microsoft. Microsoft did well to bring him on board and make him a fellow. During his part of the keynote, he demo’d Docker working in Windows. Super awesome! He also showed an actual breakpoint being hit from Visual Studio while remote debugging a .NET app on Linux. Being able to run .NET Core on Windows, Linux and Mac is awesome. It was around this time that this was reiterated. ASP.NET 5 is great. If you haven’t taken a look at it, do yourself a favor and take a look and watch some of the weekly community stand-ups the teams do. It is open to everyone! At this point the first BIG bombshell was dropped. Below, you will see this is Visual Studio Code running in both Mac and Linux. Too awesome! Oh, and it’s free! The installation experience is super smooth. From download to install it was less than 90 seconds. It was probably closer to 60 seconds. The next thing was saw was more information around Universal Windows Apps (for Windows 10). Universal Windows Apps have been around for a while, but this time it’s for real. 🙂 You can finally write once and deploy across all of Windows – even including the Hololens! But I’m getting ahead of myself. Then there was talk about the project previously known as Spartan. Microsoft introduced their new browser that will ultimately (read as a long time from now) replace Internet Explorer. This browser is called Microsoft Edge and it looks to be pretty awesome. And finally, we started to see the bit I was soooo excited about. Microsoft Hololens. It is hard to believe it is real. When they first showed this when they announced Windows 10, I was down right giddy. Sersiously, I was almost aggravated with myself over how excited I was over a piece of technology. But I couldn’t help myself. It was exciting. Seeing the demos again at Build just brought in even more excitement. I’m finding it extremely hard to wait for Windows 10 simply because of the Hololens. It is going to be awesome. Then we got to see a cool robot named B15. I’m telling you, this is going to change the way we interact with the world.